It’s Officially Summer! Celebrate with our First Recipe Suggestion! This recipe is a delicious treat, perfect for a Summer BBQ, and under 400 calories! It features flavorful grilled veggies, an amazing sauce complimented by warm melt-in-your-mouth feta cheese, and definitely enough substance to satisfy. Full of flavor and a non-guilty pleasure food, this will soon become a staple summer recipe! 3. Brush vegetables with olive oil on each side. 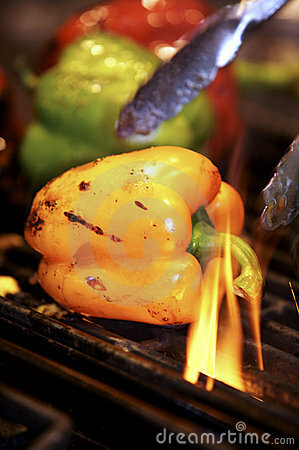 Place bell peppers and zucchini closest to the middle of the grill, and set onion and squash pieces around them. Cook for about 3 minutes, turn, and cook for another 3 minutes. The peppers may take a bit longer. Remove from grill, and set aside. 4. Spread some of the mayonnaise mixture on the cut sides of the bread, and sprinkle each one with feta cheese. Place on the grill cheese side up, and cover with lid for 2 to 3 minutes. This will warm the bread, and slightly melt the cheese. Watch carefully so the bottoms don’t burn. Remove from grill, and layer with the vegetables. Feel free to send us your recipe favorites at info@kalevfitness.com and check back for Recipes each week! Happy eating!